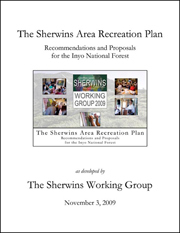 After nine months of dedicated effort and sustained collaboration between March and November of 2009, the Sherwins Working Group produced the Sherwins Area Recreation Plan, or SHARP, which details proposals for summer and winter recreation alternatives for implementation in the Sherwins area to the south of the Town of Mammoth Lakes. SHARP was recognized by the Far West Ski Association with its 2010 Jordan-Reily Award for achievements in ski-related public affairs, and was adopted by the Town of Mammoth Lakes as part of its “Trail System Master Plan” in October of 2011. 14 photo galleries of the Sherwins Working Group in action! Access the complete SHARP Project Archive! Providing your contact information will help us keep you informed on everything "SHARP" via our regular E-Newsletter, including important related trail and recreation goings-on in Mammoth Lakes!